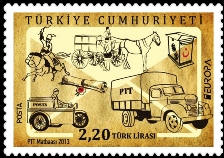 Turkey is the winner of this year's Best Europa stamp contest organised by PostEurop. Last year winner, Hungary finished second and Poland and Switzerland shares the third place. this 2.20 TRY stamp is part of a two stamp set. It's the second time Turkey wins this on line voting. The first time it was in 2011 and last year Turkey finished 2nd. The result of this competition was announced during this PostEurop's Plenary Assembly in Brussels, Belgium on the 19th September. The stamp has been selected via the internet ! All people could vote through PostEurop's website ! A total of 11'000 votes were registered, compared to last year it's an increase of 37% in the number of public votes. A jury of 9 members (stamp designers, philatelic design directors) awarded earlier this year, the Best Europa stamp - Jury prize to Finland ! The prizes for both the Jury and public voting competitions were handed out during the Belgian Philatelic Grand Prix to be held in the Brussels City Hall on the 21nd September 2013. PostEurop revamped their website ! with the Europa stamps having a good place !